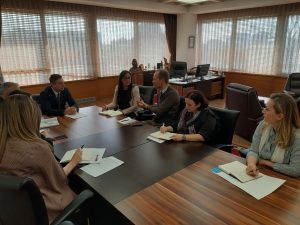 Kosovo Erasmus+ Office Coordinator, Jehona Lushaku, has held a meeting with the Minister of the Ministry of Education, Science and Technology, Shyqyri Bytyqi, with whom she talked about the role of Erasmus+ in Kosovo and next steps for further internationalization of HEIs in Kosovo. 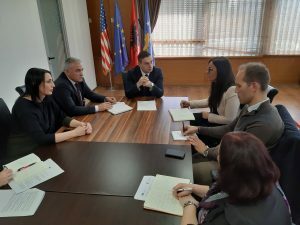 Minister Bytyqi thanked the KEO Coordinator for initiating this meeting by emphasizing the role of the Erasmus+ programme as very important for increasing the awareness on the value of the Internationalization process of the HEIs. KEO Coordinator presented the Erasmus+ strategy for the promotion of the Erasmus+ programme among HEIs, the engagement of the relevant staff in writing competitive project proposals, and strengthening the monitoring process of the Erasmus+ partnerships in Kosovo HEIs.